The Museum of Oxford is hosting a compelling new play drawn from authentic accounts of life at the home front in First World War Oxford. This original production brings to light the city’s role in the ‘War to end all wars’ and the parallel stories of the local people whose lives it changed forever. Playwright, Jeremy Allen has worked with members of the local community and delved into local archives to uncover the WW1 experiences of a varied cast of characters from Oxford’s past: including Siegfried Sassoon and Lady Ottoline Morrell, as well as many whose stories have yet to be told. City landmarks and buildings take on new meaning as their war-time role is revealed. 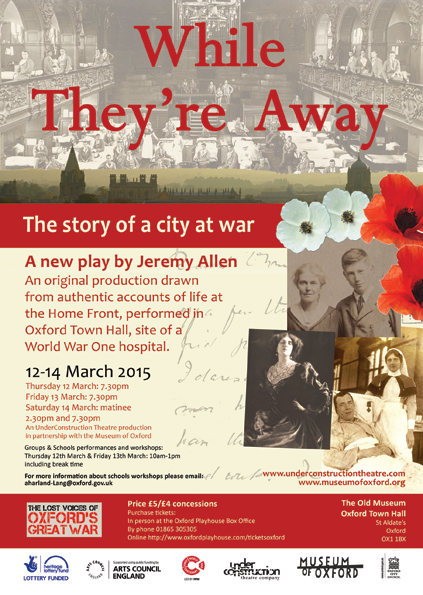 The drama is performed in the Old Museum at Oxford Town Hall, the site of one of Oxford’s WW1 military hospitals. An UnderConstruction Theatre production in partnership with the Museum of Oxford. Created as part of the Lost Voices of Oxford’s Great War, a community project to uncover the city’s untold First World War stories. Generously funded by the Heritage Lottery.